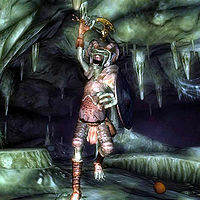 Goblins are the most common type of humanoid monster, and are treated differently from other monsters in Oblivion. The other monsters are all documented at Monsters. 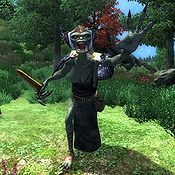 The goblins on this page are also all listed in the Oblivion-Creatures-Goblins category. 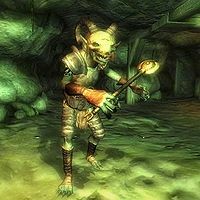 Goblins tend to live in groups in underground caves, abandoned mines and ancient ruins, the entrances of which are often guarded and decorated with at least one stake with human skulls on it driven into the ground. They are the most sophisticated creatures in the game, with many goblins having a rank and job in the group. About half of the goblins belong to one of eight tribes. Tribes represent the high point of goblin culture in the game and follow several rules. In the case of seven of the eight tribes, each tribe has its own home base cave, shaman, war chief and tribal totem staff. All members of a tribe have a tribal symbol visible on their upper right arm. Members of any tribe hate members of all other tribes. However, they will sometimes tolerate goblins who do not belong to any tribes. The shaman functions as a spiritual leader who guards the tribe's sacred totem staff. The totem is a magic staff that belongs to the tribe (although the totems all look identical, each tribe recognizes its own totem). The shaman rarely leaves the cave and does not respawn. If one is killed, the tribe is without a spiritual leader and will no longer go to war over their totem. Likewise, the goblins will become passive towards outsiders, and allow them to traverse their lairs without protest. However, they will still attack them in self-defense. Each tribe also has a war chief as their military leader. Stealing a goblin tribe's totem and hiding or placing it somewhere will not start a war though, due to distance restrictions built into the game. The only wars that occur without a mod are the ones in the Goblin Trouble quest, and the White Skin raiding party found attacking the Sharp Tooth Tribe in the Derelict Mine. Totems are kept in a specially designated place in the deepest part of the cave. Captured totems are also kept in a designated place about two thirds of the way into the cave. The Bitterfish Tribe is the main exception to goblin tribal culture. It does not have a war chief, totem, or tribal symbol in the game. They do, however, seem to compensate for this by having multiple shamans (but unlike most of the other tribes, killing these shamans will not affect the behavior of the other tribe members). Another anomaly is that a Breton named Goblin Jim acts as the White Skin tribe's shaman. Like the Bitterfish tribe, the White Skins' behavior is unaffected by whether or not their de facto shaman is still alive. When goblin caves are examined closely, insights into the level of intelligence and power of the eight goblin tribes can be found. 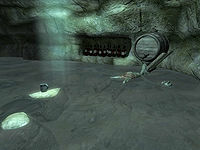 Often, prison cells can be found within the lairs holding captives that the goblins may have been using as some sort of hostage, though they are most often dead upon arrival. Goblins display a basic recognition of currency and its use (evidence of this would be the level of care goblins go to to make sure their gold is safe and secure) The caves of goblins also appear to have rooms with individual functions and purposes, such as dining halls, religious centers, storage areas, points of social gathering, and sometimes rooms as definite as throne rooms, armories, and kitchens. It seems that the culture of goblins is advanced enough to be deemed somewhat "civilized". 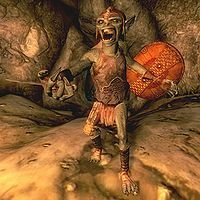 Despite their intelligence, goblins are extremely hostile and generally respond with violence to any contact with the humanoid races of Tamriel. For the most part, though, goblins rarely venture far from their lairs except to embark on raids, be it on other goblins or unfortunate travelers or farmers. Raids seem to be the goblins' primary source of food, wealth, and equipment, as they have yet to be seen practicing agriculture or manufacturing on any apparent scale. The sole exception to this is their near-universal "domestication" of rats as a form of livestock, although the choice of rats may be one of necessity rather than preference. These are the non-tribal goblins that are encountered in caves and ruins that are not occupied by any of the goblin tribes listed below. 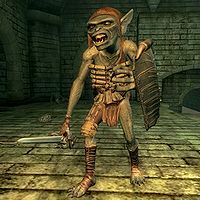 With these goblins, the type of goblin that you meet is determined based on your character's level, and is not related to any type of tribal structure. So it is possible for a single cave to be filled with multiple Goblin Shamans and Goblin Warlords (unlike tribal goblins who have exactly one shaman and one war chief). The level provided for each creature in the Lvl column is the typical player level at which the creature is first encountered. The following table summarizes the leveled lists that are used to generate generic (i.e., non-tribal) goblins. 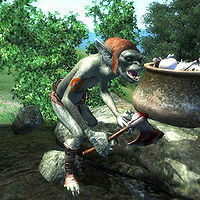 Most goblins come in both melee and archer varieties and usually whether the goblin is a melee or archer type is randomly determined (low level goblins have a 1 in 3 chance of being an archer; warlords have a 1 in 4 chance of being an archer). A few leveled lists, however, specifically request only melee goblins or only archer goblins. Both melee-specific and archer-specific goblin lists include Goblin Shamans. 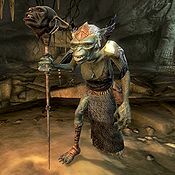 Although superficially the Bitterfish Tribe may appear similar to all the other goblin tribes in the game, it is really a tribe in name only. This tribe does not have a totem staff and does not have a tribal symbol. They tend to carry Scales on their person. It is made up of randomly generated goblins who do not have any tribal relationships (either with each other or with other tribes). There is no Bitterfish war chief. Whether you encounter a Bitterfish shaman is randomly determined; if you revisit Miscarcand multiple times it is possible to kill multiple Bitterfish shamans. All other tribes have exactly one shaman and one war chief, although only the shamans are non-respawning. * For details about the shield, see notes at Goblin Skirmishers. ** For details about the shield, see notes at Goblin Berserkers. Has 20 members, plus an additional two standard leveled list goblins that patrol outside the cave. ***Only the Shaman is identified as "Three Feathers" instead of "Three Feather"
The White Skin Tribe is the only named tribe without a Shaman. Their leader is the Breton Goblin Jim. In Desolate Mine during the quest of the same name. Boss Savage Goblin in Desolate Mine during the quest of the same name. Goblin Skirmishers are relatively low-level goblins. For standard (non-tribal) goblins, Skirmishers are encountered starting at level 6. Most goblin skirmishers have a 50% chance of carrying a shield. The shield has equal chances of being Leather or Steel in quality. 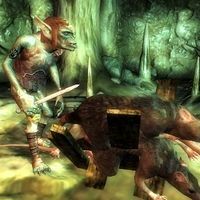 For those goblin skirmishers who are encountered at all levels (e.g., tribal Goblin Skirmishers and those at Odiil's Farm), this provides an opportunity for low level characters to obtain an relatively good quality shield (normally Leather and Steel quality shields are not seen until level 3; this allows them to be found starting at level 1). Goblin Berserkers are at the middle of the goblin hierarchy. For standard (non-tribal) goblins, Berserkers are not encountered until level 10. Most goblin berserkers have a 25% chance of carrying a shield. The shield may be Leather, Steel, Chainmail, or Dwarven in quality, with equal chances of any of the four types at all levels. 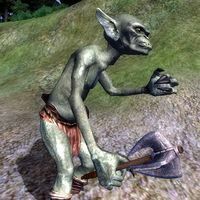 For those goblin berserkers who are encountered at all levels (e.g., tribal Goblin Berserkers and those at Odiil's Farm), this provides an opportunity for low level characters to obtain an unusually good quality shield (normally Chainmail and Dwarven quality shields are not seen until level 6; this allows them to be found starting at level 1). Their weapons, on the other hand, are leveled and therefore low-level characters will only obtain Steel weapons from Goblin Berserkers. One lying under an empty beer keg in the Crayfish Soggy Bottom section of Crayfish Cave. One on top of an archway in the Lost Boy's Hidden Bastion section of Lost Boy Cavern. One lying on the rocks outside of Infested Mine clutching a beer bottle. One in the Horn Cave section of Horn Cave. One in the Toadstool Hollow section of Toadstool Hollow lying in a barrel. One in the Breezeways section of Newt Cave, lying on a bench surrounded by bottles. Template for goblins in Miscarcand during the quest of the same name; provides default behavior for "Attack" goblins. Template for goblins in Miscarcand during the quest of the same name; provides default behavior for "Lazy" goblins. The Bloody Hand and Dust Eater tribes also appear in ESO. Goblin archers will almost never equip melee weapons in close range, and instead use hand-to-hand combat. ? This page was last modified on 25 December 2018, at 17:23.